Welcome to A Sampling Bee! 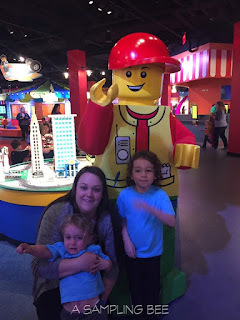 Today, I share with you our visit to LEGOLAND Discovery at the Plymouth Meeting Mall in Philadelphia! I was very fortunate to attend their press preview on March 31, 2017. LEGOLAND and we got to be one of the first families to look at all of the attractions. 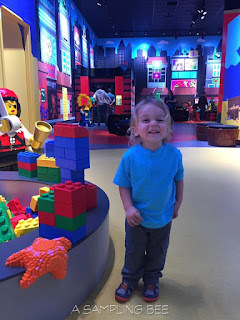 LEGOLAND Discovery Philadelphia is an awesome facility that is going to make Lego lovers very happy! 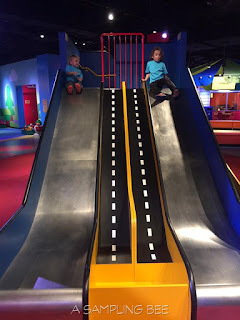 Imagination Express: An interactive LEGO ride that takes visitors on an adventure that starts at the Brick Station and goes from a soapy bath all the way to outer space. LEGO 4D Cinema: Guests will be on the edge of their seats as an incredible action adventure unfolds in 3-D before their very eyes. The film comes to life in the fourth dimensions as flurries of wind, rain, lightning and even snow burst in the auditorium! LEGO Racers- Build & Test: Let your imagination take over as you build your vehicle and take it to the ramps. Test your car and see how you can make it go faster! Once you have built the ultimate race car, time its speed on the test track. Pirate Adventure Island: Go on a swashbuckling quest in the soft play area aboard a LEGO-themed pirate ship. Adventure through whimsical scenarios as you climb the rigging, walk the plank and capture the flag. Then, escape down the slide to make it ashore to the island's castle. Earthquake Tables: Visitors can build their own LEGO skyscrapers and see if their creation can survive the shaking earthquake-stimulating tables. DUPLO® Park: Little builders can let their imagination loose in the DUPLO® Park. Build a colorful farmer's garden, climb up a small hill and slide down the other side or play on the special big, soft bricks. The brand new LEGOLAND Discovery Center also holds 25 minute workshops that are lead by experienced LEGO builders. There is also a café where you and your family can enjoy a quick snack or meal. Looking for a place to have your child's birthday party? 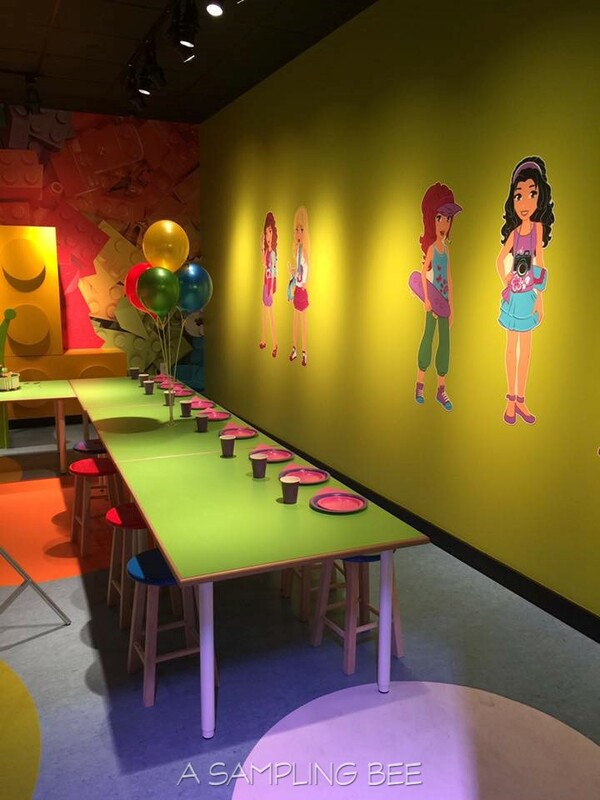 Book their party at LEGOLAND Discovery Philadelphia in one of their party rooms! Visit the Discovery Center's website HERE to purchase single-day admission passes, birthday party packages and annual packages. My family and I had such an awesome experience at the press preview for LEGOLAND Discovery! Walking into the Plymouth Meeting Mall in Philadelphia and seeing the bright LEGOLAND Discovery building was the best! My sons both ran straight for the entrance. After our welcome, and photos, the doors opened! We were one of the first families to ride on the Imagination Express Train! It was so fun to ride an interactive Lego ride. My boys loved the ride. Next, we headed further into the discovery center and my boys ran right to the LEGO Racers- Build & Test area. This is where we spent the majority of our visit. The boys made their own race cars and they enjoyed racing down the slide alongside them. I had to tug them to different parts of the discovery center. :) We got to play with the giant rubber Lego bricks, which my youngest son loved! We also got to experience MINILAND. MINILAND is an awesome display of Philadelphia Landmarks including Independence Hall, Logan Square, Boathouse Row, City Hall, Citizens Bank Park, etc. And if you stay at this attraction for long enough(which you will because there is SO much to look at) the room goes dark and all of the buildings light up. There is even a little firework show! After hours of fun, these 3 attractions are our favorites. Every square inch of the center is covered in Lego themes! We had an the best time and we are looking forward to visiting again soon. We stopped at the Lego store, too! We got to meet Bert the giant Lego figurine! Visit https://philadelphia.legolanddiscoverycenter.com/whats-inside/ for more information and to buy tickets! Tickets: $19- $59. 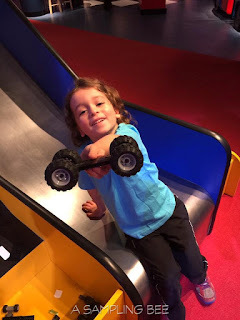 I am giving away two(2) packs of four(4) tickets to LEGOLAND Discovery Center Philadelphia! I will choose two winners on April 21, 2017. Winners will be contacted via email and will have 24 hours to respond. Tickets expire December 31, 2017. US only. Good luck! The earthquake tables looks really cool. We would love the interactive Lego ride, not to mention all the huge lego displays! This blog post is very helpful!! I cant wait to bring my son there to explore! Thanks for ur blog post and the giveaway!! The lego ride looks fun. I think the whole thing!! It would really blow my son's mind! I still can't get over this great place I recently visited! This isn't only a good place. It is also one of the best Seattle venues around here. There isn't a listing of the unique offerings, although there should be! This place was magnificent!